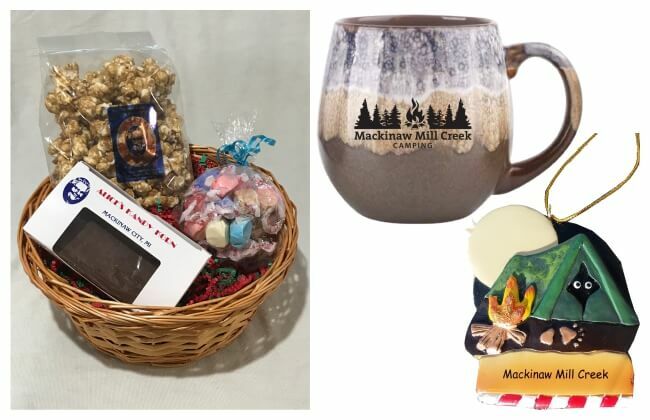 Christmas gifts for campers from Mackinaw Mill Creek Camping. Featuring Holiday Gift Baskets with custom ornaments, coffee mugs, keychains, teddy bears and treats from Alice's Kandy and Korn. 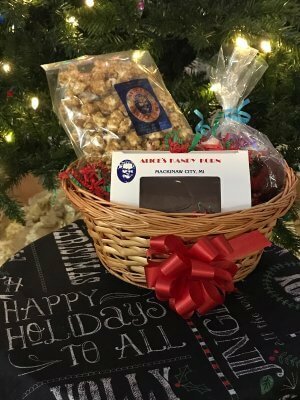 All Gift Baskets come with 1/2 pound each of Caramel Corn, Chocolate Fudge and Salt Water Taffy from Alice's Kandy & Korn! Customize your Gift Basket with a brown or blue coffee mug and a custom Christmas ornament from Mackinaw Mill Creek Camping. You can choose a vintage camper oranment, tent ornament or airstream trailer ornament. Or choose a Kid's Gift Basket with a teddy bear (complete with a buffalo plaid Mill Creek sweater) and a double-sided keychain. 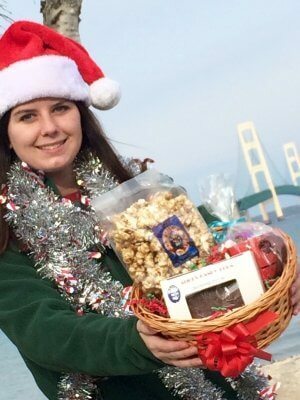 1/2 pound of: Alice's caramel corn, chocolate fudge & salt water taffy. 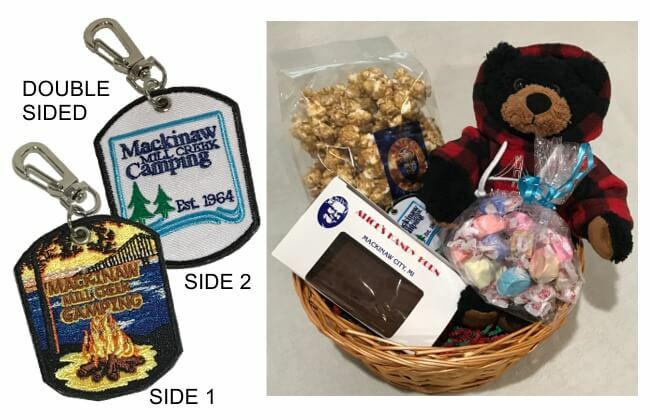 Includes teddy bear & double-sided keychain. Teddy bear is rated safe for children over 3 years of age. 1/2 pound of: Alice's caramel corn, chocolate fudge & salt water taffy. 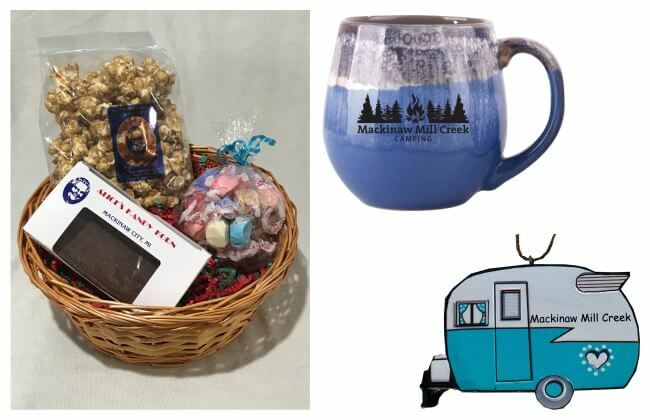 Includes blue mug & airstream ornament. 1/2 pound of: Alice's caramel corn, chocolate fudge & salt water taffy. Includes blue mug & tent ornament. 1/2 pound of: Alice's caramel corn, chocolate fudge & salt water taffy. Includes blue mug & vintage camper ornament. 1/2 pound of: Alice's caramel corn, chocolate fudge & salt water taffy. 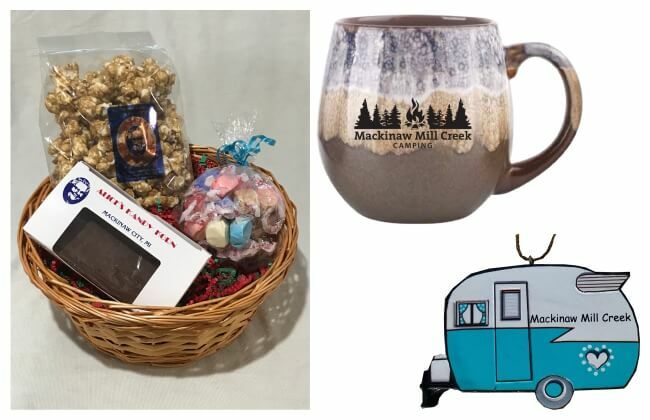 Includes brown mug & airstream ornament. 1/2 pound of: Alice's caramel corn, chocolate fudge & salt water taffy. 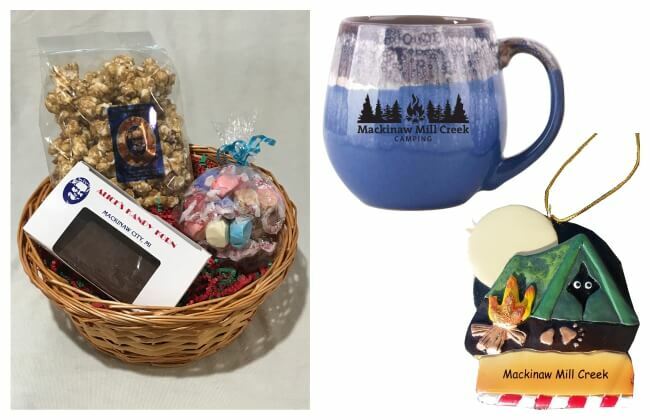 Includes brown mug & tent ornament. 1/2 pound of: Alice's caramel corn, chocolate fudge & salt water taffy. Includes brown mug & vintage camper ornament. We had the best time camping at Mill Creek Campground, we spent a week of our honeymoon September of 2014. We enjoyed it so much we are planning to go every year on our anniversary. The view from the campground was breath taking. From where our campsite was you could see the Mackinaw Bridge out our kitchen window and the Grand Hotel from our bedroom. The campsites where very spacious, bathhouses very clean and people incredibly friendly. 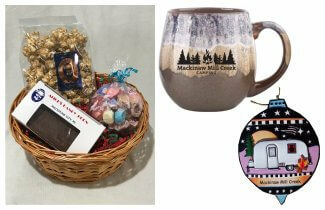 We went to the semi truck show in St. Ignas, we toured the Ice Breaker Mackinaw, and did some shopping in town. We cannot wait to go back soon. The best place we have ever stayed!!! Thank you for giving us memories to last a life time.